I think you didn’t tell me about your chronic illness because I didn’t create a space for you to share with me more about your whole self. I wasn’t fully open and honest with you either – I’m sorry. Living with an invisible illness isn’t easy, and sometimes the shame and stigma that is associated with our conditions hinders our ability to be forthcoming about this important aspect of our lives. But, our silence perpetuates the invisibility of our illnesses – just saying. I think you didn’t tell me because you’re so used to, and good at, managing your condition on your own. I am too! I wonder if you thought I’d judge you. I wonder if you thought I wouldn’t believe you. I wonder if you thought I’d be scared. The truth is, I was more scared when I didn’t know how to take care of you that one night after we got home from our adventures downtown. When you stopped responding to me, I wasn’t sure if I should give you juice, call 911, get your test strips, or just wait for you to feel well enough to tell me how I could best help you feel the ground beneath your feet again. When you live with a chronic, yet invisible illness, you become accustomed to putting up a front. With me though, you don’t have to worry about that. Instead, talk to me! Please. Tell me the signs and symptoms that I should be look for. I need to know what I should be aware of in case there is an emergency when I’m with you! In return, I’ll pledge my friendship, unwavering support, and reciprocity. When you share your experience with me, you can expect some comical commiserating, and a whole lot of empathy. You can expect me to ask you some follow up questions so I better understand your lived experience. You can anticipate that I will say “I can relate,” and share my own experiences too so you don’t feel too overly exposed or alone. I’ll share that sometimes my pain is so distracting I notice everything! For example, when my pain keeps me up at night, I often debate which is the lesser of the many evils, the constant blowing from ceiling fan in my room or the discomfort from my value brand sheets. I’ll surprise you by telling you about my “sixth sense” – the ability to sense vibrations. Then for fun, I’ll shock you by telling you that you have a text message when your phone is across the room. To be honest, vibrations really hurt me. So, after that I might ask you to please keep your phone on silent when we’re together. I’ll explain that sometimes my pain is so sudden and severe that I retreat quickly – even from those who are closest to me. I’ll be physically present, yet mentally I’ll be somewhere far, far away. I’ll explain that without some sense of relief I may not even be able to articulate what I’m experiencing or how others can help me. And then while I’m feeling good, I’ll share some tips and tricks for how I’d like you to be my friend in those excruciating moments. Pro tip: try to distract me! I’ll also share that when the pain subsides, momentarily, I have a really difficult time imagining it actually hurt that bad in the first place. I probably won’t want to talk about it. Finally, I’ll ask for you to please believe me and respect me. I’ll remind you that I’ll always extend to you the same respect and acknowledgement. Revealing this aspect of my life early and often isn’t a call for attention or praise. And, if you share your history of chronic illness with me, I won’t think you’re looking for attention either. The fact is, if you’re going to invest in being a part of my life, and vice versa, you need to know when to worry and when to let me figure it out. I hope in the future you’ll feel comfortable sharing with me more about yourself. If you tell me more about your chronic illness, it will help me continue to learn how to be your friend, support you, and grow our relationship. 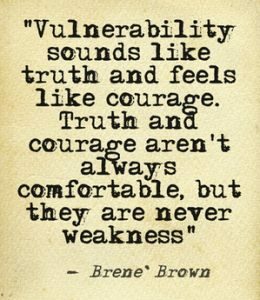 I realize that vulnerability is hard work, and sharing a part of your story requires bravery and courage. I also know you’re incredibly strong. I’m here to listen whenever you’re ready.